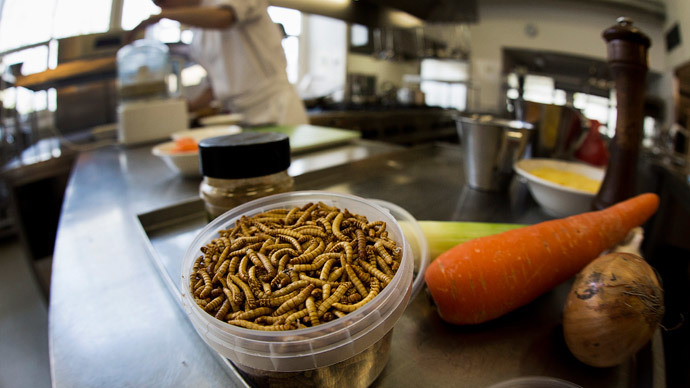 A Belgian supermarket has officially started selling a range of products that contain insects, mainly mealworms. The country is the first EU state to approve insects in food. For now, customers of the Belgian food retailer, Delhaize, are being offered two varieties of spread based on mealworms: with tomatoes or carrots. Called “Green Bugs”, the brand-new food looks nothing like traditional insects, which for example Thai people traditionally sell and eat as a snack. It may be a can of worms, but there are no visible parts of mealworms and nothing is moving. In fact, each product has between 4 and 6 percent insect content. The carrot spread is 4 percent worms, while the tomato version has 6 percent. “Mealworms are chopped very well; it is not possible to see them with the naked eye,” said Delhaize. Cans of “Green Bugs” spread look more like baby food or mashed vegetables. “Products made from insects are trending at the moment, and Delhaize wants to reaffirm its role as a pioneer in the field of food retailing,” said spokesperson Roel Dekelver, as cited by Flanders Today.